Having performed at the Kimmel Center, Reading Terminal Market, the Tenth Presbyterian Church, City Hall, Haverford College and of course, the Tomlinson Theater and the Performing Arts Center, junior Anna Saurman is starting to make her mark in the classical music world. 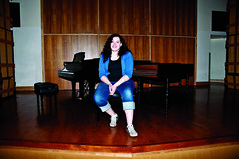 As a voice performance major, Saurman is a member of the Temple Opera, concert choir and graduate conductors chorus. Her most recent performance was in the opera “Les Mamelles de Tirésias,” but Saurman said she has her performance sights set much higher than her already growing list of venues. The Temple News talked with the songbird about why she chose opera, what her favorite musical performances are and why she didn’t abandon singing after a poor audition. The Temple News: What would be your ideal career? Anna Saurman: I want to be an opera singer. I would be happy with a chorus choir at the Metropolitan Opera, which is obviously idealistic, but I want to be a superstar. I want to be able to sing wherever I want, like Renée Fleming. But very few people get that far. I will probably have to do something else on the side. I’ve considered ethnomusicology – the anthropology of music. I could analyze and study music from around the world. Either way, I’m doing something musical. AS: I’ve loved opera since I was 7 or 8 years old. I don’t know why. I guess I was just a weird little kid. I was just drawn to it. I was in the car with my dad when I was little, and he played “Pirates of the Penzance,” which in the realm of opera isn’t exactly epic. It’s not a [Richard] Wagner or anything, but I thought it was so cool. It was kind of like a movie with no pictures, so I really had to focus and listen to it. And then I started singing along. I wouldn’t let my dad sing along at all. I had to sing every part myself. TTN: Who are your favorite musical inspirations? AS: In the classical realm I love Jessye Norman. She is this crazy dramatic soprano who sings whatever she wants. She will even sing parts made for guys and do a pretty good job. If I had to pick one band to be my favorite, it would have to be the Beatles. The album, “Revolver” is my favorite. I used to fall asleep to it as a child. The Beatles are my musical security blanket or teddy bear. TTN: What has been your worst experience with singing? Have you ever wanted to quit? TTN: What has been your favorite performance? AS: My junior year of high school, my choir took a trip to Washington, D.C., and we visited the Kennedy Center. We were just touring and convinced the guides to let us up on stage, and we just started singing. The place was completely empty, but I remember thinking that one day I would be back there singing for real, and hopefully, there would even be people in the audience. “Side Show” takes place in the 1930s, when the main characters have difficulty expressing themselves amid society’s norms.